I actually hold four Guinness World Record categories to my name: I’ve held the Guinness World Record for the Tallest House of Freestanding Playing Cards since 1992, and Largest House of Freestanding Playing Cards since 2004. I’ve bettered my own records a number of times over the years. 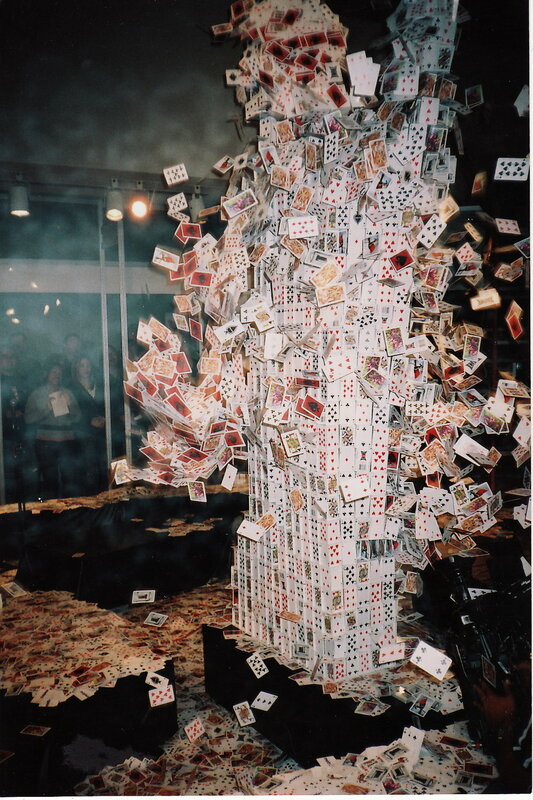 I even worked with Guinness and LG Electronics to set a new record for Tallest House of Freestanding Playing Cards Built in 12 Hours, set in 2016, which I constructed on a running, fully loaded washing machine. 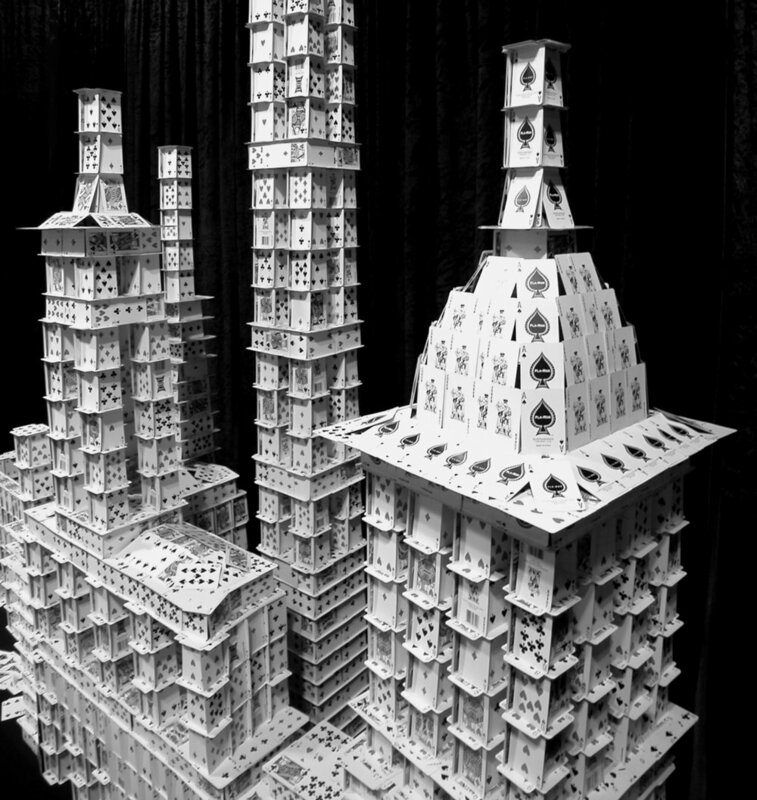 And, most recently, I worked with Guinness and LIVE with Kelly and Ryan to create the Tallest House of Freestanding Playing Cards Built in One Hour in 2018, on live television. It’s true that I have a very strange line of work, and it can be very interesting to try and explain to someone who has never seen it or who has no idea how big and crazy the Marketing and Events world is. 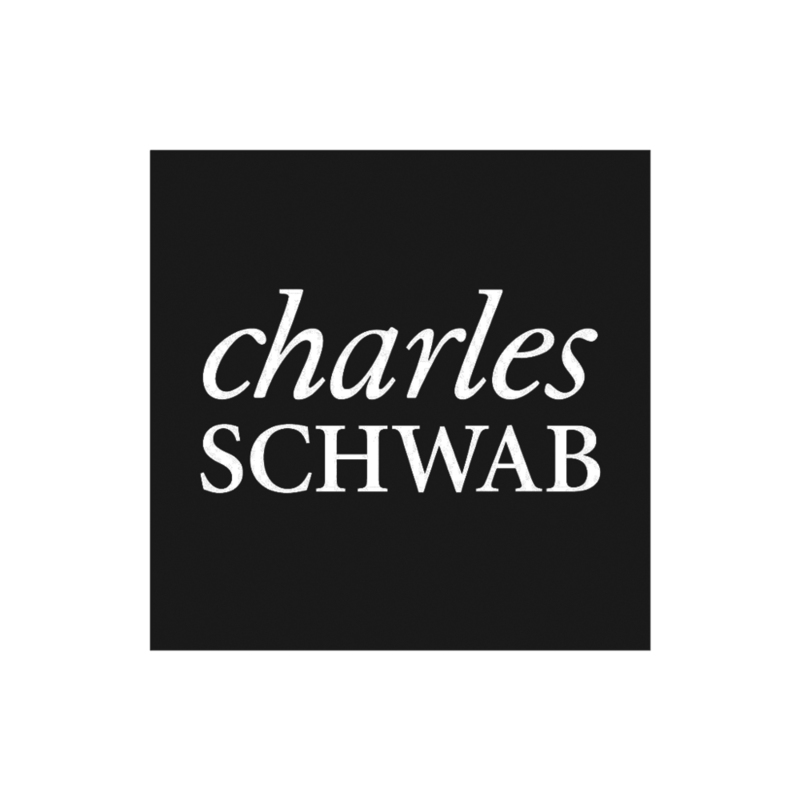 My official background is architecture, and I have a professional degree in that field from Iowa State University, and a Master of Design Studies from Harvard. 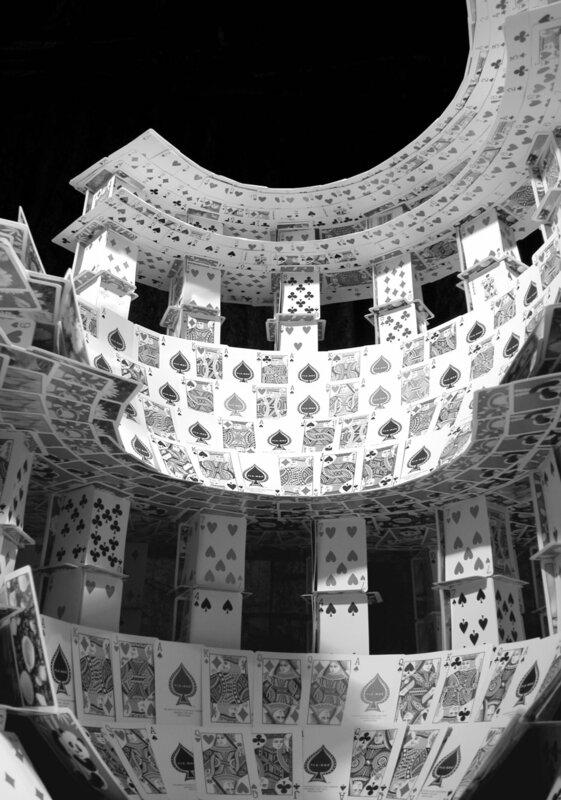 When people find out about my architectural background, they usually assume that my academic training is the real reason I can build freestanding structures out of cards (no tape, no glue, no tricks) the way I do. 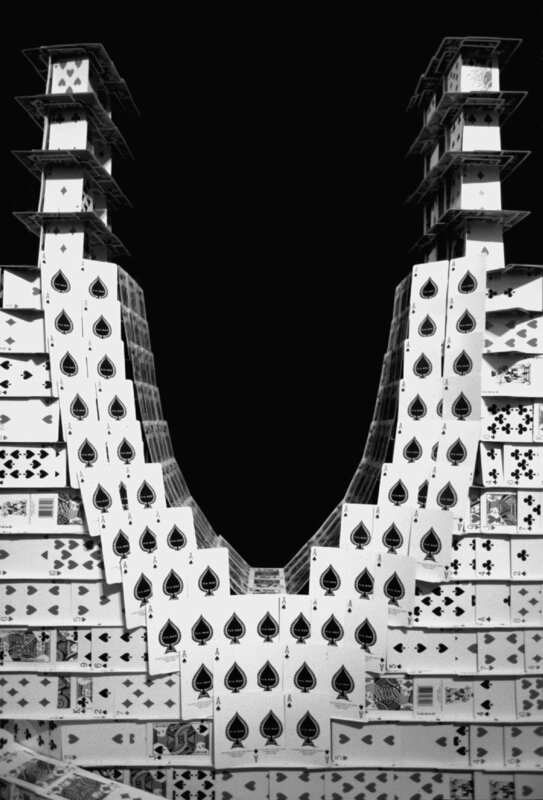 But, in reality, it was the opposite: my love of cardstacking led me to pursue architecture. These days, cardstacking is my profession, and it has been since 1994. I’m very fortunate to do something I love for a living. I’m a creative person, so it is always a treat to help my clients envision a project and then travel to some far-off place and make it come to life. I was introduced to cardstacking by my grandfather when I was about eight years old. My grandfather was in the theater business, but in his spare time he was a pretty dedicated card player. I can recall many weekends of my childhood that played out like a card tournament, where the whole family got in on the games. It was common for my grandfather to build a small house of cards right there on the table between matches. He’d get about three, four, maybe five stories and it would come crashing down—he’d pound his fist on the table and smile. By this point, my grandmother had refilled the drinks, and the game would start up again. It was magical, and it was all I needed to see as a kid to know that I wanted more and more cards to build bigger and bigger on my own. As time went on, I got better at cardstacking by just trying different ideas, and this trial-and-error method continues to this day. I get a little better and a little faster with every project. I’m completely self-taught and still learning a great deal. Other than my crazy job and very unique skillset, I’m a pretty regular guy with a wife and family, complete with a little one and a dog. When I’m not cardstacking, I like to work on creative architecture projects and be in the great outdoors. I think it is important for each of us to try and spend time doing things we love to do; as for me, I love cardstacking and its inherent challenges and creative thinking, as you can probably tell by looking at my work. Enjoy. So far, I've stacked cards around the world for clients in fourteen countries and countless cities on six continents.